They don’t make comedians like Kathleen Madigan anymore—the kind of blue-collar, everyman’s comic who tours from town to town for the pure love of a live show. Born to a large Irish Catholic family in the Midwest, Madigan came up with the likes of fellow friends Lewis Black and Ron White. Over the past 25 years, she’s taped three specials, released four albums, toured Iraq and Afghanistan, and hosted her own radio show on Sirius XM. She’s seen it all, and in her shows, she discusses it all—from the inanities of travel to the pitfalls of living in a large family. New Times recently spoke with Madigan over the phone about her tour, the status of stand-up comedy, staying relevant, and who the hell Kevin Federline is. LAUGHING MATTER: Comedian Kathleen Madigan’s been doing stand-up for more than 20 years, been featured on countless late night shows, and even wrote for Garry Shandling when he hosted the Emmys. NEW TIMES How are you doing? KATHLEEN MADIGAN Fine and dandy. Gettin’ ready to go the Midwest. NEW TIMES How’s the tour been going so far? MADIGAN I’ve got no circulation left. I’m nothing but a shell of a person. No, it’s been a really fun year. No complaints. Lots of gigs. Lots of travel. I try not to complain, try not to lose my mind at TSA. The biggest part is how do you keep from getting sick on planes. I don’t know. I eat a lot of gummy multivitamins, say no to, ‘Hey, let’s go out to 20 beers tonight’—something I probably would’ve said yes to 20 years ago. When I used to do clubs, I’d stay there a week. Now, it’s one night. Doubling the travel. It’s a different set of challenges. NEW TIMES Since you’re on tour most of the time, is that where you get most of your material? How do you keep things fresh when you’re on the road? MADIGAN That’s where everything happens. I don’t wait for stuff to happen. You gotta keep moving, meeting strangers who keep saying stupid things. It’s all in my act. I do a thing about flying into Norfolk, with a mermaid-themed airport. There’s a big chunk on that. Usually the road is enough. My family is there. There’s a lot. I’m leaving tomorrow. It’s all under control. It’s also a lot of fun. I’d rather be from a big family…because there’s an endless amount of conversation. Whatever it may be about—our lives, perspective, conversation. And they’re all pretty funny. NEW TIMES You’ve been doing comedy for more than 20 years. Do you think your approach or your subject matter has changed at all? MADIGAN Bizarrely enough. I was the same 20 years ago, so really are my subject matters. It’s not on purpose. I think you figure out what you are. My subject matters are traveling, family, politics, and current events. I don’t really get into celebrities. I was on one of those VH1 shows, and they ask me, “What you do you think about Kevin Federline?” I think he plays for the Detroit Redwings. I’m like what? I don’t know anything about Britney Spears. What about her husband? I don’t follow her husband. I’ve just been me the whole time. It’s like Jim Gaffigan talking about family and food. Those are the things I’m interested in. NEW TIMES It seems almost like a different world, comedy back then. There’s more niche comedy now, people like Maria Bamford and Patton Oswalt. How is it different for comedians coming up now? 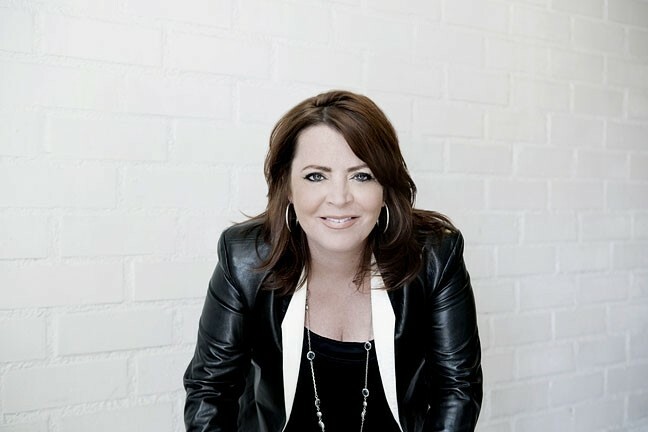 ONE NIGHT STAND: You can see Kathleen Madigan at Cal Poly’s Performing Arts Center on Jan. 16, at 8 p.m. Tickets range in price from $16 to $40. For more information, visit pacslo.org or call the box office at 756-4849. MADIGAN I think it’s harder for them. There’s no focus. When people all the way back to Carson—two-thirds of the country watched Carson every night. The only thing that two-thirds of the country watch now are the Super Bowl and a mall shooting for about an hour. So, unless you time travel and go to Johnny Carson, how do you get attention? With Leno, you still get attention. All of the networks keep dropping. They consider American Idol a hit because they’re comparing it to different things. Maria [Bamford] and Patton [Oswalt] were still on those shows when people were paying attention. There are good things about it. Sirius Radio has been great. Netflix has been a real gift for us. Maria and Patton have found their audiences. They were exposed to everyone, and their people found them. NEW TIMES Looking back, how much has the comedy business changed since you began? MADIGAN I'm just glad I did what I did, and there was a way to make a way. There was a path you could go on. I'm sure there is now, but there are too many outlets, too many venues. Nobody is paying sole attention to any of them [comedians]. I like Twitter for the news feed. It's a big thing for us, almost like my office. I can see what other comedians are doing. Let's say I'm a normal person, then Twitter is to read the news much faster. Lew [Lewis Black] and I, we always go, "I can't believe you get all your news off Twitter and believe it." I don't know the sources, but it's the fastest news. What do I care if for two days I think Bon Jovi is dead then I find out he's alive? I love Twitter, but apparently, it's a niche group of us that are in that too. I don't know. You have 56,000 followers reading something, but what does that translate into? For me, it's just fun. I found an audience. NEW TIMES Do you think there's an expectation now for comedians to get a TV show? That's the new pathway? MADIGAN Yeah, I think it is. Even if you get a show now. OK. Next question: is it a hit? Everybody is looking for the next Everybody Loves Raymond. There isn't one. Ray Romano started when we didn't have the Internet. It's getting more fractured and splintered and fractured and splitered. It's bizarre. There used to be a guarantee, but not anymore. What does that do for me? I don't particularly love acting. It's not for me. And how is that gonna translate into ticket sales? NEW TIMES Do you feel any pressure to change your act to gain new audiences? MADIGAN No, you can only do what you’re doing. You find a way to make the Internet your stage. At this stage, no I can’t. I don’t even care enough. I’m thinking how much more money I need to retire. It’s crazy, really crazy, when I see people my age go, “I’m gonna do this.” They [the younger audiences] don’t care about an old person. We’re old to them. There’s a point of demarcation. Now, you’re Betty White or Cloris Leachman. Now, the young people like you. There are a lot of lost years between 55 and 75 where you’re just some person still working. NEW TIMES You’re one of the few comedians left who does work primarily on tour. What do you still love about that way of working? MADIGAN It’s almost like circuitry. It’s like, to keep moving and feel what’s going on everywhere. Not just in my hometown, but in Montana. I like to see what’s going on. I could’ve just as easily been some field reporter. I could’ve been the news crew that chases and finds what’s happening. I like live audiences. The amount of comedians that tape specials and don’t do shows will never cease to amaze me. On the road, there’s probably 20 of us that do it for real. This is our job. There are others who diversify. We’re just the joke people, the part of vaudeville. I like the live shows, being a part of real people. That’s why TV stuff, I don’t resonate with it. Everything takes so long. Even when you do The Tonight Show, there’s an in-house audience—they’re my focus. In those 200 people, there’s probably my people. Jessica Peña shamefully knows who Kevin Federline is. You can contact her at jpena@newtimesslo.com.